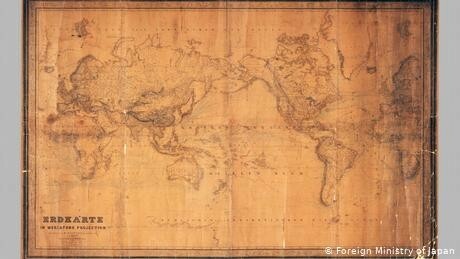 In a ceremony in Hamburg on Monday, a copy of the map was donated to Germany's Federal Maritime and Hydrographic Agency in a gesture that Japan's Foreign Ministry said was a demonstration of the "good bilateral relations between Japan and Germany." However, a single inscription on the map makes the gift a far more significant present, at least in the eyes of Japanese nationalist circles. In small but decipherable letters, the words "Japanisches M" (Sea of Japan) appear over the stretch of water that divides the Japanese archipelago from the Korean Peninsula. This year, South Korea is marking a century since a major uprising against colonial Japan's occupation of the Korean Peninsula. Rifts over the two nations' shared history are deepening, and that makes the inscription significant. For decades, the scale of atrocities committed during World War II caused Japan to turn sharply away from nationalism. However in recent years, Japanese Prime Minister Shinzo Abe's government has adopted a more nationalist stance. Some recent steps include revising the use of historical terminology. In 2018, the Japan Times elicited controversy when it said it would switch the term "forced labor" to "wartime labor." This caused outcry in South Korea, which said 150,000 of its people died in Japanese mines and factories. The Japanese daily also said it would find a new definition for women grouped under the term comfort women, which refers to South Korean women who were forced into prostitution during World War II. South Korea also insists that Japan has not done enough to compensate comfort women or forced laborers. And the struggle of defining history between Japan and South Korea doesn't stop with the Second World War. Seoul has recently been stepping up a campaign to change the geographic designation "Sea of Japan" to the "East Sea," according to Japanese claims. Japan is resisting those efforts and the Japanese Foreign Ministry told DW in a statement that the name "Sea of Japan" is the "only internationally established name for the sea area concerned." Many in Japan currently consider the left-leaning administration of South Korean President Moon Jae-in to be working hard at rewriting history. And some in Japan even consider a geographic designation on a 163-year-old map produced by a foreign country to be a sign supporting a Japanese claim in a long-running dispute with South Korea. "Currently, the term 'Sea of Japan' is still prevalent around the world, but South Korea is pushing its claim everywhere, including in the United Nations, so the Japanese government has no choice but to respond to protect our interests," said Yoichi Shimada, a professor of international relations at Fukui Prefectural University. "It is important that Japan communicates that message to Germany," he added, saying that South Korea was trying to win support for its interpretation of history by being "clever" in "playing on Germany's historical guilt." Stephen Nagy, a senior associate professor of international relations at Tokyo's International Christian University, said that ties between Japan and South Korea "are the worst they have been since the two governments signed the treaty that normalized relations in 1965." The two governments have bickered over historical issues for decades, Nagy points out, but the rift has never been this severe. Late last year, South Korea claimed that a Japanese reconnaissance aircraft flew too close to one of its warships. The Japanese side said that the Korean ship had locked its fire control radar onto the Japanese plane. Seoul also refused to permit a Japanese warship to enter a Korean port on the grounds that it would fly the rising sun ensign, which Korea claims is a throwback to Imperial Japan, but which Tokyo points out is the recognized flag of its Maritime Self-Defense Force. South Korea regularly protests when Japanese school books make no mention of the suffering that Imperial Japan inflicted upon its neighbors. They also dispute Japan's claim to sovereignty over islands that lie halfway between the two nations; known in South Korea as Dok-do, but appearing on Japanese maps as Takeshima. "There are lots of problems in the area of sovereignty and both South Korea and Japan have presented maps that they consider support their claims to territory or the names of geographical features," Nagy said, adding that having these claims recognized in the past helps with legitimacy. "This is why the 1856 map is so critical to Japan's argument," he said. The full story behind the chart is not completely clear, although the ministry says it was printed in Germany on copper plates and given to Japan in 1938. The two nations were allied at the time and in that year, the German liner SS Gneisenau brought a delegation of 30 members of the Hitler Youth to Tokyo for a study visit. It is possible that the map was presented on the occasion of that visit.